THE COLD STORAGE WAREHOUSE AT VERONA was built in 1931, and is among the largest of its kind in Europe. The circular hall in the middle of the large three-tiered storage building is 80 ft in diameter and 98½ ft high. The maximum capacity of the warehouse is seventy-six trucks in twenty-four hours. Verona, lying in the centre of the Lombardy plain where the Bologna-Brenner and Milan-Venice trunk lines intersect is one of the most important junctions in Italy. THE use of snow and ice for cooling and preserving foodstuffs has long been known, though the manufacture of artificial ice is only a hundred years old. In hot countries, snow falling during the winter on the mountains was formerly collected in large pits dug into the ground, covered with layers of leaves and brushwork, and finally with earth. In this primitive though efficient way the snow was preserved and made to last through the warm season. Even to-day such snow-pits are to be found in Sicily and in some other parts of the world. The oldest documentary evidence of the use of ice is contained in an ancient collection of Chinese lyrics, the Shih-King, dating from before 1000 BC, in which religious ceremonies for the filling and emptying of ice cellars are described. The ancient Greek biographer Plutarch discusses the question whether the covering of snow-pits with earth and brushwork is as efficient as chaff, and Roman cookery books contain recipes for the making of ice-creams. While snow was used in south-ern countries, natural ice took its place in the north, where it was collected from the frozen rivers and lakes. The ice was stored in underground cellars, where it was kept during the summer months. This system is still largely used in cold countries. It is not many years since natural ice was almost exclusively used in England after having been sent from Norway in large steamer loads. The manufacture of artificial ice is a comparatively modern invention, for which credit is due to British scientists. In a paper read at the Royal Society in 1662 Robert Boyle showed the way to artificial refrigeration and indicated various cooling mixtures for freezing water. The investigations of the great Faraday carried the matter further, but it was not till 1834 that Perkins patented the first refrigerating machine. This was based upon the use of ether. Since then the refrigerating industry has made enormous strides, particularly during the last forty years. It is no exaggeration to say that few other inventions have influenced the economic and hygienic conditions of the world to a similar extent. When we buy in England fruit and vegetables out of season, or other perishable goods from the Dominions, such as New Zealand lamb or butter, South African eggs, and Canadian cheese, we probably never give a thought to the difficulties that had to be overcome in transporting such goods across the seas, or even across the comparatively short distances of the European continent. Few of us realize what profound studies and exhaustive investigations were necessary before fresh fruit, whether hard-skinned oranges or delicate peaches, could safely be carried over long distances without impairing its flavour and appearance. Each category of perishable goods, and each individual fruit or vegetable or meat, has its particular physiological and biological properties. A degree of refrigeration that suits the solid body of an apple would prove fatal to the much more delicate peach or fig. Each single article had to be studied under many aspects. Experiments were carried out for many years until the best method of refrigeration, the most suitable temperature, and the requisite degree of humidity were established. A new science was created. Thousands of refrigerating engineers, chemists, biologists, scientists, horticultural and agricultural experts are now engaged all over the world with the problems of further improvements. Italy has for centuries supplied many European countries with fresh fruit and vegetables. But what was once the privilege of the wealthy, who alone could afford peaches, grapes, or even oranges, has become in these days accessible to a much wider public. This is due to the progress of the refrigerating industry, which maintains the goods in a perfect condition over long periods and obviates expensive transport by special fast trains. It is not, therefore, surprising that a country that derives much of its wealth from the products of the land should have devoted particular attention to the important question of refrigerated transport of fruit and vegetables. The main railway system of Italy is State-owned. The private railway companies possess lines of secondary importance that act as feeders for the main system. Some years ago the State Railways created an Experimental and Research Institute, which is one of the best equipped in the world. Among the many activities of the Institute is the problem of refrigerated transport. It is obvious that ordinary laboratory research work cannot produce the same valuable results as practical tests carried out in working conditions. Thus it was found necessary to build a special isothermic chamber in which practical tests could be carried out in conditions of temperature and humidity identical with those encountered in practice. 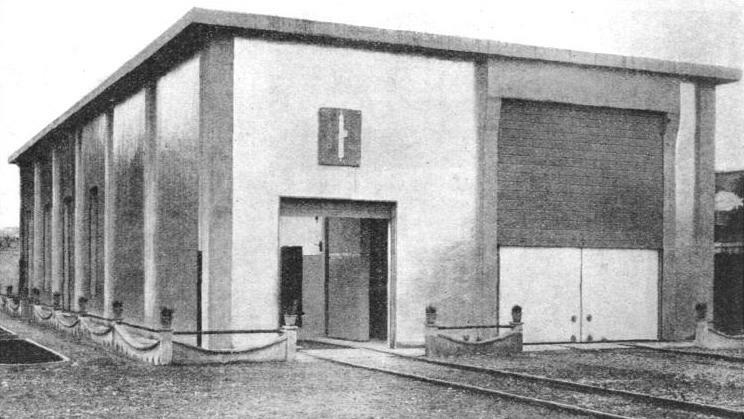 After this chamber had been in use for several years the railway administration decided to erect at the end of 1934 a new isothermic chamber in which the latest devices and appliances were introduced. This Italian structure for research is considered to be one of the most remarkable of its kind at present in existence. The new building has a length of 84 ft, a width of 36 ft, and an internal height of 18 ft 9-in. It contains two isothermic cells, of which the larger, 19¾-ft. wide, occupies the whole length of the building. The smaller cell is 16½-ft long and 13 ft wide. The cubic capacity of the cells is 28,050 and 3,730 cu ft respectively. The walls are 8-in thick and are constructed of a special material known as “Cellulite”. This is a light cement of cellular structure, either supplied in blocks or cast on the spot. The thermal conductivity of this material ranges between the low figures of 0·045 and 0·07; thus the material is eminently suitable for insulation. The walls on either side are faced with reinforced concrete 2-in thick. The outer sides of the walls and the roof are faced with heat-reflecting polished aluminium. Particular attention has been given to the construction of the two-leafed doors. These are built in the same way as the walls and rotate on pivots in roller bearings. Each leaf weighs 1 ton 7 cwt. Double rubber strips set into the edges ensure the hermetical closing of the doors. In the centre of each of the cells a railway track has been laid; this is connected with the marshalling yard in Rome. The purpose of the isothermic cells is to investigate the insulating properties of refrigerated and isothermic trucks and containers, and at the same time the conditions of the loaded goods in different atmospheric conditions. It is, therefore, necessary to reproduce these atmospheric conditions artificially by heating or cooling the cells to the desired temperature. Temperatures vary in Italy to a degree unknown in England. While, for instance, the temperature on a day in December may be 62° F in Sicily, it may be only 28° in Milan, or even 15° in Bolzano. Temperatures of 96° F in the summer are normal in Sicily, and are sometimes even encountered in the Lombardy plains. It follows that a truck travelling from the south to the north of Italy is exposed to sudden variations of temperatures or to an intensive heat during the whole voyage. We can well imagine the state in which fruit or vegetables would arrive at their destinations if the refrigerated or insulated trucks (without ice boxes) were not impervious to external heat. The artificial temperature within the cells is produced by forced air circulation effected by two electric helicoidal fans. These take the air through ducts which are placed lengthwise below the ceiling. The air passes over electric heating resistances placed within the ducts in front of the fans. It comes out on the other side of the fans into another series of ducts situated below the former set. Subsidiary electrical heaters near the floor accelerate the heating, fans being placed near them to distribute the hot air in an even manner. When low temperatures are required within the cells, the air is made to pass over ammonia-filled coils which are also placed in front of the fans. To produce very low temperatures two refrigerating plants have been installed. Each set consists of a vertical ammonia compressor with a corresponding self-starting electric motor, the tubular spray condenser, coils, and the usual accessories. The automatic regulation of the temperature is effected by thermostats placed within the cells. By means of relays and contactors the thermostats cause the starting or stopping of the motors which drive the compressors and the fans. The insertion or disconnexion of the electric resistances, and the opening or closing of the circuit of the condenser water, take place at the same time. AN INDICATOR in the machine room of the Verona cold storage warehouse. The illuminated lines and dots indicate that those cells and galleries are occupied, and also that the ventilators are in action. The control and measurement devices are installed outside the cells in a separate chamber. They consist of indicators and controllers of temperature agreeing with the thermostats within the cells. There is also the central apparatus which indicates the temperature and humidity corresponding to that of the thermometers and hygrometers in the cells. A multiple registration apparatus gives sixty simultaneous readings derived from sixty thermo-couples which are used for tests in various points of the cells, and within the loaded trucks or containers. These thermo-couples are particularly important for measuring the inside temperature of the loaded trucks at the various points. Thus it is possible to find out for certain whether the air in the loaded trucks is equally distributed. This is a most important point, and tests are continually being carried out with loaded and refrigerated trucks. The thermocouples are often inserted into the pulp of the fruit at different points of the truck to test the penetration of the cold air inside the fruit. A perfectly uniform distribution of refrigerated air, within the truck, circulating through the shelves and trays containing the fresh fruit, is necessary to ensure that the whole load will reach its destination unimpaired. Certain fruits and vegetables do not require transport by refrigerated trucks. It is necessary only to load them in isothermic trucks suitably insulated against excessive heat. The insulating properties of these trucks are severely tested in the cells. The State Railways have built many thousands of special trucks of both kinds, all of which comply with the British require-ments, as the traffic from Italy to England is a considerable one. The Societá Italiana Ferryboats in Milan has hired 1,300 such trucks from the State Railways for use on the Zeebrugge-Harwich ferry. THE APPROACH to the warehouse at Verona. A railway line connects the main hall of the building with the shunting lines which lead to a nearby goods station through a large entrance gallery. The warehouse has a total of eight galleries. 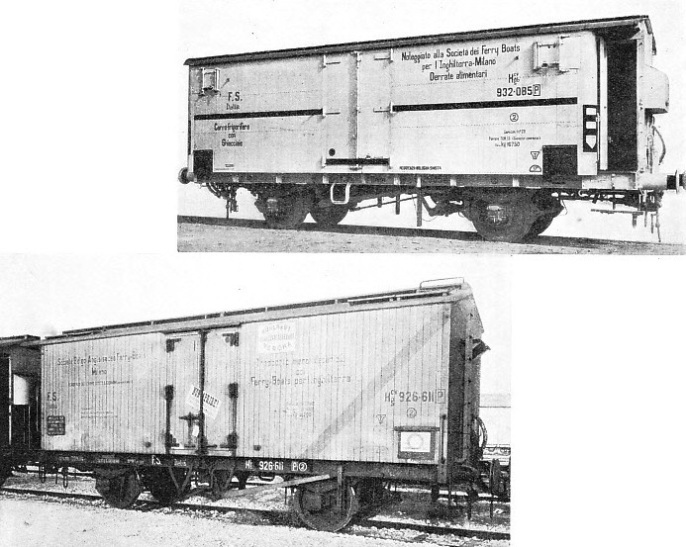 The specially built refrigerated trucks have a cross-section identical with that of the Continental type trucks of the LNER. The length between buffers is 32¼ ft and the length between wheel centres 14 ft 9⅛-in. Interior dimensions are: length 26 ft 1¾-in, width 7 ft 2-in, and height 6 ft 2-in. The trucks are equipped with the Westinghouse brake, having a type of valve which permits their use in goods trains fitted with automatic brakes. These trucks are further equipped with compressed air brakes for use on the British lines and with hand and lever brakes. The steel-framed body is lined inside with iron sheeting and outside with timber, the space between being filled with cork slabs protected by bituminous pulp-board. The floor is V-shaped, to allow water to drain off. Over this floor is laid a second floor, consisting of removable gratings which allow free circulation of the cooled air. At either end is placed a galvanized iron cage which contains 1½ tons of ice, which is loaded through openings in the sides. There are four openings in all. Two are fitted with electric plugs for working fans which are placed below the ice boxes for the purpose of pre-cooling the loaded trucks before they are sent off. On the inner sides of the walls wooden bars are fixed at different heights. By laving wooden planks or wooden gratings over these bars the whole interior can be divided into horizontal compartments. Thus goods in bulk or in packages can be loaded at the same time, or various classes of goods in light packings can be placed without danger below heavier packages. The insulated roof is protected by a raised wooden canopy. The tare weight of the trucks is 16¾ tons and their load capacity 13 tons, including 3 tons of ice. THE CENTRAL HALL of the Verona Cold Storage Warehouse. The floor of the hall is occupied by a turn-table. Over this turn-table the trucks are conveyed after they have been loaded for pre-cooling in the galleries, a process which lasts six hours. The transport of fruit and vegetables by refrigerated trucks necessitates various preliminary operations which cannot be carried out by the small farmer. As Italy is pre-eminently a country of small-holders, means had to be devised to create suitable organizations to undertake the grading and packing of the fruit. This is a most important operation on which depends the success of sales in foreign markets. Badly packed fruit is liable to arrive in a damaged condition at its destination. Sometimes whole cases have to be thrown away. In other instances part of the contents of a package is damaged and fetches, naturally, very little or nothing when put up for sale. Only well-packed fruit which reaches, say, Covent Garden in a perfect state will fetch good prices for the benefit of the small-holder. Many of the farmers have formed co-operative societies which own grading and packing warehouses in the principal centres. Some of them have installed refrigerating plants to keep the fruit at suitable temperatures before it is loaded in the refrigerated trucks. In other instances cold storage warehouses have been erected by private companies, or by municipalities owning the public market halls. They are generally found in the main agricultural and railway centres. Prominent among these cold storage warehouses is that of Verona, built in 1931, on an original plan. It was, and probably still is, the largest of its kind in Europe. Verona, situated in the centre of the Lombardy plains, is one of the most important railway junctions in Italy. It lies at the intersection of the trunk lines from Bologna to Brenner (for Austria) and from Milan to Venice. It is famous for its peaches and other fruit. In spring the blossoming orchards are an unforgettable sight, not less beautiful than they appeared to Romeo under “yonder blessed moon that tips with silver all these fruit-tree tops”. The Verona cold storage warehouse is of circular shape, and consists of three concentric rings. The core of the building is a circular hall of 80 ft in diameter and 98½ ft high. Practically the whole floor is occupied by a turn-table which can carry two trucks at a time. A railway line connects the hall through the main entrance gallery with the shunting lines leading to the goods station. This arrangement ensures rapid and easy communication between the warehouse and the freight trains. Besides this main gallery there are seven other galleries, each provided with a railway track from the central hall. THE LAY-OUT of the cold storage warehouse. A-F, Receiving halls; B, C, D, E, Storage halls; 1-9, Refrigerated cells; G, Refrigerated galleries. The wavy lines represent insulated outside walls. These galleries have each a width of 18 ft, part of which is occupied by a loading ramp running alongside the railway track. Four of the galleries have each a length of 72 ft and hold two trucks; one gallery is 114 ft long and holds three trucks. The remaining two galleries are each 136 ft long and hold four trucks. These last two galleries communicate with the exterior and with the shunting lines. The galleries are kept at low temperatures, which can be regulated at will. Their main purpose is the pre-cooling of the loaded trucks. Between the eight galleries (including the main entrance) are eight storage cells of trapezoidal shape, which are also kept at low temperatures. The eight galleries and eight storage cells occupy a circular area which forms the second ring. Round this area the ground-floor outer ring has been built, so that the diameter of the whole circular area is 360 ft. 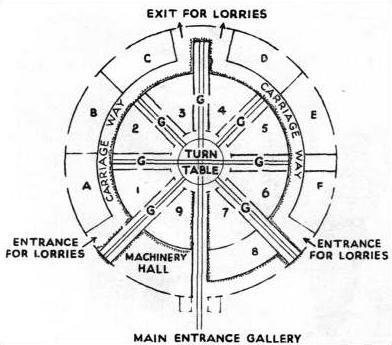 The outer ring contains the extensions of the main entrance and of the two above-mentioned communicating galleries, and also eight trapezoidal halls corresponding to the cells. In one of these halls the refrigerating machinery is installed. The other seven halls are used for different purposes. Some of them are accessible from outside, and serve as receiving rooms for produce brought by lorries from the neighbouring farms. From the receiving rooms the goods are transferred to the grading and packing rooms, whence they pass to the cold storage cells. To increase the storage capacity of the refrigerated cells an intermediate floor has been built about 6½ ft above the ground floor. It is constructed of wooden trestles supported by concrete girders. The trestle construction allows the free circulation of the cold air. 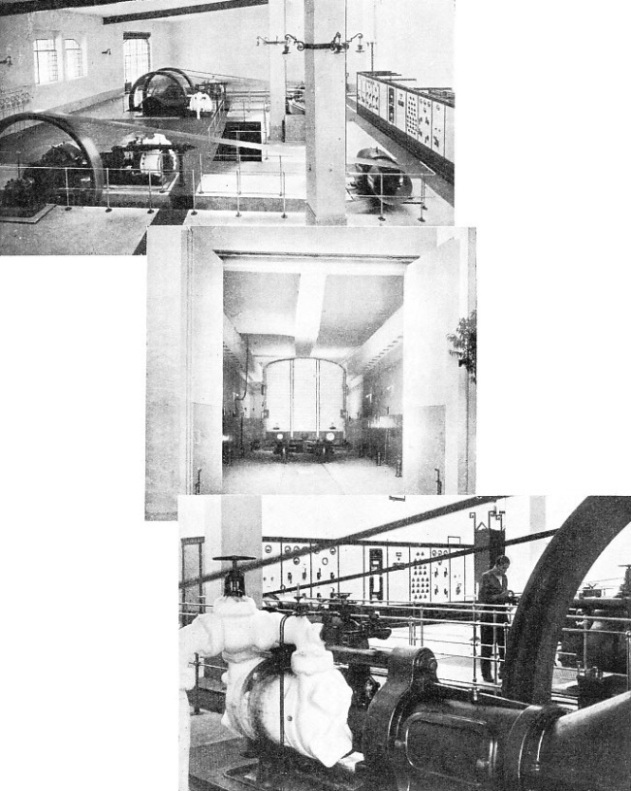 The first floor of the building is constructed in the form of a ring, the inner diameter of which is 82 ft and the outer 230 ft. On this floor an ice-making factory is installed, occupying a hall 151 ft long and 20 ft wide. The plant can produce 60 tons of ice a day. On either side of this hall are situated the ice storage rooms, which have a capacity of 300 tons each. The ice plant is situated above the main entrance gallery and is connected with it by means of a number of chutes through which ice is shot into the ice tanks of the refrigerator vans standing in the main gallery. Four trucks can be filled simultaneously with ice, the operation taking only ten minutes. Once the trucks have been filled with ice they are conveyed over the turn-table to the refrigerating galleries for pre-cooling. The pre-cooling of a loaded truck lasts six hours and, as nineteen trucks can be dealt with simultaneously in the seven galleries, the total capacity of the warehouse is seventy-six trucks in twenty-four hours. The galleries are cooled by refrigerated air driven through rectangular insulated ducts by electrical fans. This system is the quickest for cooling, and it has the advantage that the fans can be stopped instantaneously. The storage cells are cooled by a combined system of circulating cold air and by radiators running along the upper part of the walls. This arrangement permits an exact regulation of the degree of humidity - a vital factor in the proper cooling of agricultural products. The cells have a volume of 50,000 cubic feet each and a capacity of 200 tons each. The fans have a capacity of 1,060 cubic feet of air per minute, and are driven by direct-coupled 6 hp motors; the driving shaft is extended so that the motor is situated outside the cell. The air coolers are installed between the ceiling and the false ceiling. They have steel coil evaporators, the length of the coils of each cooler being 1,650 yards. The radiators in the cells are also of the tubular type. The total length of the coils is 20½ miles. To ensure uniform distribution of the cold air in the irregularly shaped cells, a double ceiling has been constructed ; this is provided with a number of circular openings through which the air passes. Exhaust channels have been constructed below the intermediate floor. A COLD STORAGE CELL in the Verona warehouse. The storage cells are cooled by a combined system of circulating cold air and by radiators along the upper part of the walls; this ensures the correct degree of humidity, which is important in cooling farm products. Each cell has a volume of 50,000 cubic feet and a capacity of 200 tons. The refrigerating machinery consists of three similar horizontal tubular compressors, running at 150 revolutions per minute. The electrical machinery comprises three 3-phase asynchronous self-compensated motors of 150 hp each. Three electric pumps coupled to 15 hp motors pump water from a specially sunk well. Other motors are installed for the ice factory, for operating cranes, the turn-tables and so forth, the total power installed being 969 hp. An outdoor transformer Cabin contains five transformers totalling 1,050 kVA for stepping down incoming current at 6,000 volts to the required service voltage. 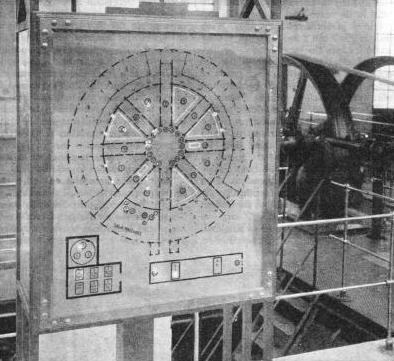 In the machinery hall and in the manager's office illuminated indicators are installed which represent a diagram the whole installation. Whenever a gallery is occupied by trucks or a cell is in use this is shown on the indicator. Similarly each fan, each motor, each crane, and each transformer is shown, when working, on the indicator. 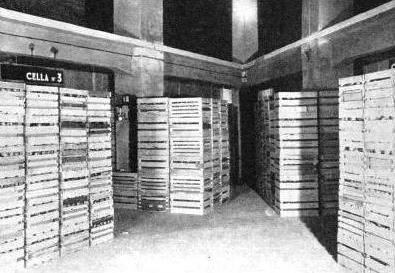 COUNTING THE CRATES during the loading of refrigerated trucks. Note how the contents of the truck have been spaced to allow for the free circulation of air. 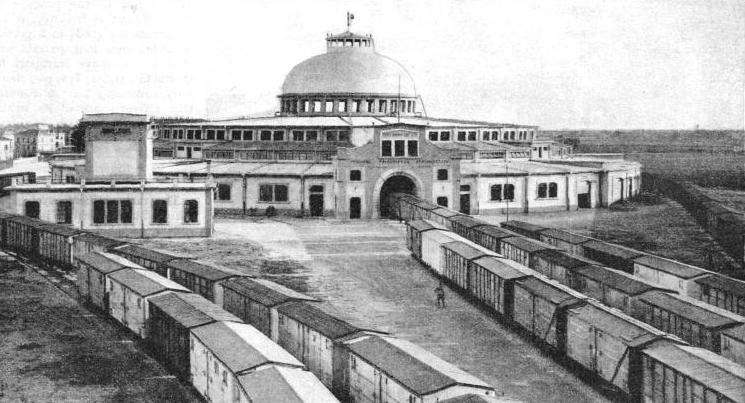 The introduction of containers as a means of transport has partly revolutionized railway transport. The advantages of containers, which avoid transhipment and the packing of goods in separate cases, have induced the Italian State Railways to investigate their possibilities when adapted to refrigerated conveyance. Here again the great value of the isothermic chamber in scientific research work became evident. It was mainly responsible for the successful introduction of refrigerated containers, which are most certainly noteworthy for the originality of their conception and execution. The refrigerated containers have external dimensions of 7 ft 8⅝-in by 8 ft 6⅜-in by 8 ft 2⅜-in. These dimensions have been chosen to enable the loading of three containers on one flat truck, keeping within the British standard loading gauge, so that the containers may travel on British railways. The containers rest on four legs; this facilitates their handling in various ways. Thus a barrow can be pushed underneath, or an electrically-operated trolley with a low platform, on which the container is placed and driven through the streets. Or use may be made of a frame on rollers and attached to a small motor tractor. The ease with which these containers can be taken from one place to another is particularly important when loading fresh fruit, as they can be brought direct to the orchards where the fruit is grown and loaded on the spot almost direct from the tree. This prevents repeated handling of the fruit, as well as transhipment operations. READY FOR THE RAILWAY. Three refrigerator containers loaded on to a rail truck. The containers are constructed of double walls of welded steel plates. The space between these plates is occupied by cork slabs. The roof is heavily insulated and the ice tanks have a capacity of 330 lb. The containers are built of double walls of welded steel plates, the inter-space being filled with two layers of expanded cork slabs, each 4·33-in thick. This material has been chosen because of its low conductivity, which is thirty per cent lower than the usual granulated or conglomerated cork. The outer steel walls are reinforced by a steel framework, and the inside has a wooden frame. For obvious reasons there is no metallic connexion between the walls. The insulated roof is canopy-shaped, and has two openings leading into the ice tanks. These metal tanks have a capacity of 330 lb each and have at the bottom a number of cooling fins. The openings can be hermetically closed. Goods are loaded through the opening on one side of the container, and a heavily insulated door provided with rubber tubing round the edges closes the loaded container, making it air-tight. A tap in the floor allows the discharge of the accumulating condensed water, and of the water used for washing the inside. The ice water is not discharged as with the refrigerator trucks, but is left in the tanks, since the experiments have shown that it remains at a practically constant temperature of 32° F in the tanks. The goods are loaded in special trays provided at the bottom with projecting ribs so that, when placed on top of one another, a tree space remains to allow the free circulation of the cold air. This is important, because it ensures the uniform distribution of the air in every corner of the container. 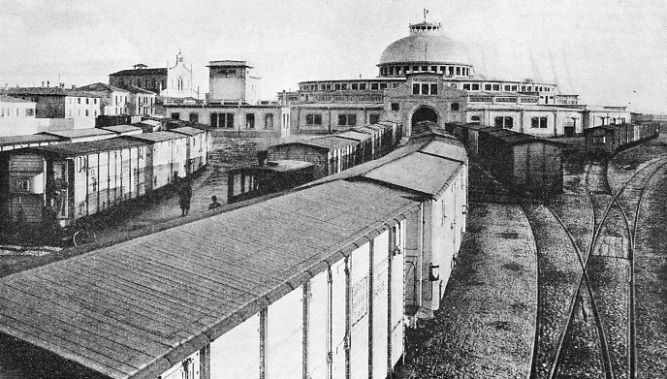 THE ISOTHERMIC BUILDING of the Italian State Railways at Rome. This building has a length of 84 ft, a width of 36 ft, and an internal height of 18 ft 9-in. The building houses two isothermic cells, the purpose of which is to test the insulating properties of refrigerated and isothermic containers and trucks, and also the conditions of the loaded goods under different temperatures. When perishable goods are transported at low temperatures it is necessary for the loaded containers to be pre-cooled to a given temperature, which must be maintained as constant as possible during the whole journey. Pre-cooling can be effected in big centres where suitable installations are available, as at Verona. But in small towns where similar accommodation does not exist, or in outlying districts where perhaps not even ice is obtainable, other means had to be devised. A series of subsidiary containers was constructed, in which the necessary machinery could be installed. These could be easily trans-ported to places where facilities for pre-cooling do not exist. All have the same dimensions, namely 10 ft 8-in by 7 ft ⅝-in by 7 ft 2⅝-in, which is the size of the International Type 62 according to the specification of the International Container Bureau in Paris. In the first container is a complete pre-cooling plant. 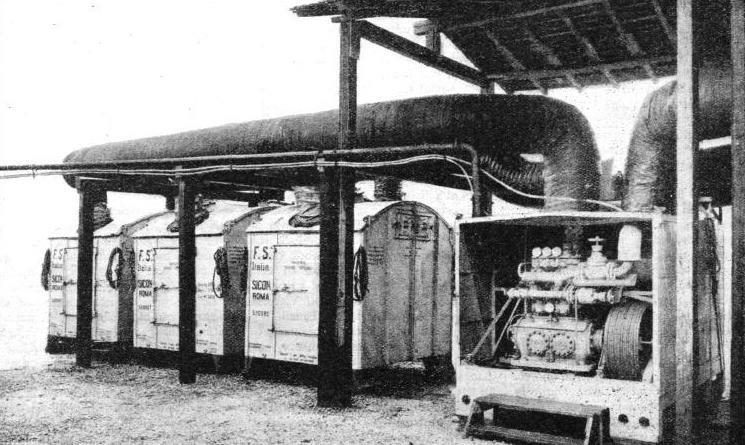 This consists of an electrically-driven ammonia compressor, a tubular condenser with water circulation pump, a radiator for the compressed and liquefied ammonia, a coil evaporator, and two reversible fans. In the second container the water-cooling plant of the spray type with two fans is fitted. The third container has a complete transformer and converter plant, which makes it possible to connect it anywhere with the local current or even with the high-tension lines. A fourth container holds a new type of ice-making machine for use in places where ice is not available, such as villages or remote farms. This machine consists mainly of a rotating drum, on the inside walls of which water is sprayed, where it turns to solid snow, which is scraped off by rotary knives. The machine can produce as much as 660 lb. of solid snow per hour. When the entire installation is required for pre-cooling purposes the containers arc conveyed by lorries or hauled by tractors to a large orchard or farm. The plant is set up in the following way. On either side of the refrigerator plant container empty containers are placed up to a maximum of three. A collapsible double conduit line is laid from the refrigerator plant to the other containers by inserting the tube-like ducts into the openings of the roofs of the containers. The main ducts are specially provided with vertical branch ducts, which at their junctions arc suitably insulated by special materials. At the rear of the refrigerator plant container are placed the other containers with the water-cooling plant and the electric transformer plant. After the containers have been loaded the doors are hermetically closed, the air-tight junctions between the ducts and containers are checked again and the refrigerating plant set in motion. The cooled air is driven by one fan through the ducts into the container on one side, and exhausted by the second fan through the second duct back to the refrigerator plant container, where it is taken up by the first fan and driven again into the loaded container. A MOVABLE PLANT of loaded refrigerator containers. An entire refrigeration plant for pre-cooling purposes, together with containers, can be conveyed to the orchard or farm and the miniature cooling station set up. A loaded refrigerator container can keep the desired temperature for 144 hours during a journey without the ice having to be renewed. THE REFRIGERATING PLANT at the Verona cold storage warehouse comprises three horizontal tubular compressors running at 150 revolutions per minute. The electrical machinery is three 3-phase asynchronous self-compensated motors of 150 hp. ANOTHER VIEW of the plant at Verona is seen in the photograph on the right. 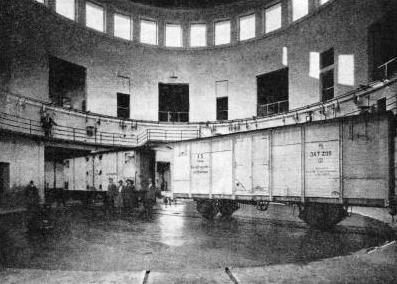 The centre photograph, supplied by the Ministry of Communication, Rome, shows the new Isothermic Building of the Italian State Railways, with a refrigerated truck inside the large cell. Each wing of the double doors weighs 3,024 lb. 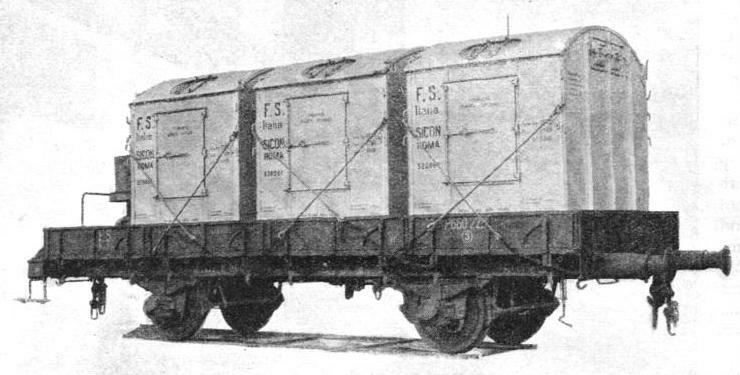 SPECIAL REFRIGERATOR TRUCKS built by the Italian State Railways for direct trade between England and Italy. Many trucks of the types shown in these photographs are in service on the Zeebrugge-Harwich ferry. The tare weight of numbers of these trucks is 16¾ tons, with a load capacity of 13 tons, including 3 tons of ice contained in galvanized iron cages. 7 ft 8⅝-in by 8 ft 6⅜-in by 8 ft 2⅜-in. 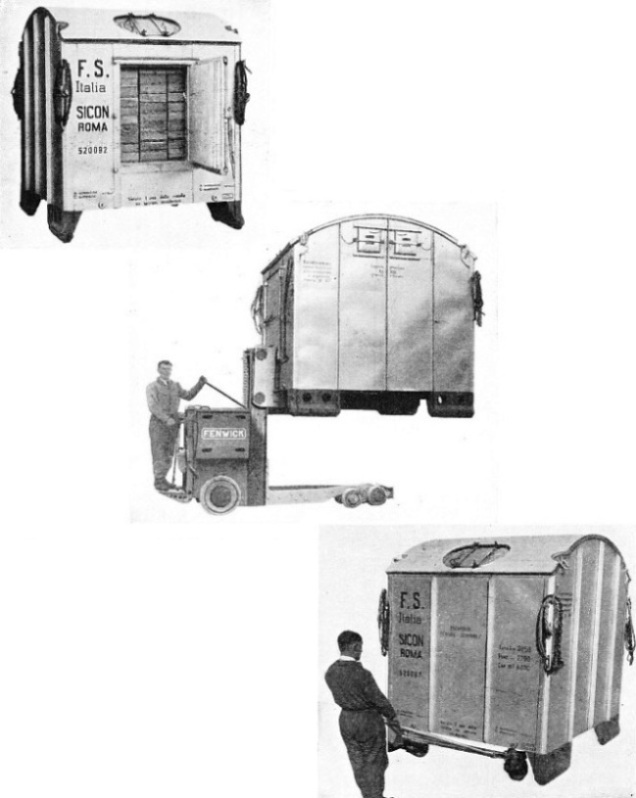 The centre photograph shows a hydraulic lift trolley which easily raises a loaded container on to a railway truck. THIS SHOWS a special truck placed underneath the container. An advantage of these containers is the facility with which they can be conveyed from place to place. The containers are perfectly airtight. 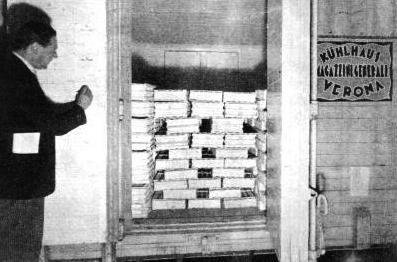 Goods are loaded through an opening on one side, and the door is heavily insulated with rubber tubing round the edges. The load of the container has also to be specially arranged to permit free circulation of air.